You can export a .csv (Comma Separated Values) file of your leads by clicking on Leads in the main menu, and Export in the submenu. 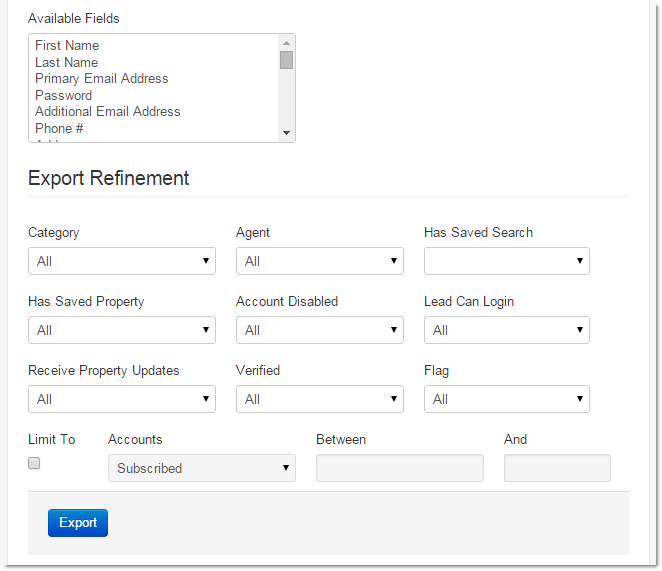 To export leads, click Create from the Exports drop-down menu. On this screen, you will see a list of fields you can use to set up your export file. First, select the fields you would like to include in your export from the Available Fields selectable list. Then, in the Export Refinement section, use the options here to determine which leads will be included in the export. When you are ready, click the Export button and you will be prompted to download and save your file. You can then open up the file in a spreadsheet program like Excel. You can also save your export by using the Save Exports section at the bottom of the screen. Simply type in a name for your export, and click Save. This can be handy if you are going to need to download the same type of lead list weekly, or monthly. You can also manage any saved exports you already have stored in your account by clicking Manage from the Exports drop-down menu. Here you will see all of your saved exports arranged in a table. The Tools column provides you with several options for each saved export. Use the Trash icon to delete any saved exports you no longer need. Use the Preview icon to view a pop-up box containing the details of the export. Use the ​Export icon to export an updated list of leads based on the predefined export criteria.